It's official. We saw Finding Dory and there's no denying it. Baby Dory might be even more adorable than Nemo. We didn't think it was possible, since the little clownfish had us wrapped up in his tale to find his dad and he melted our hearts along the way. Then, along came Dory, who had her parents teach her all about hide and seek, while dealing with her “short term memory loss.” And did you see her playing in the sand while her parents hid? Well, let's just say that our heart resembles a puddle of melted ice cream all over again! 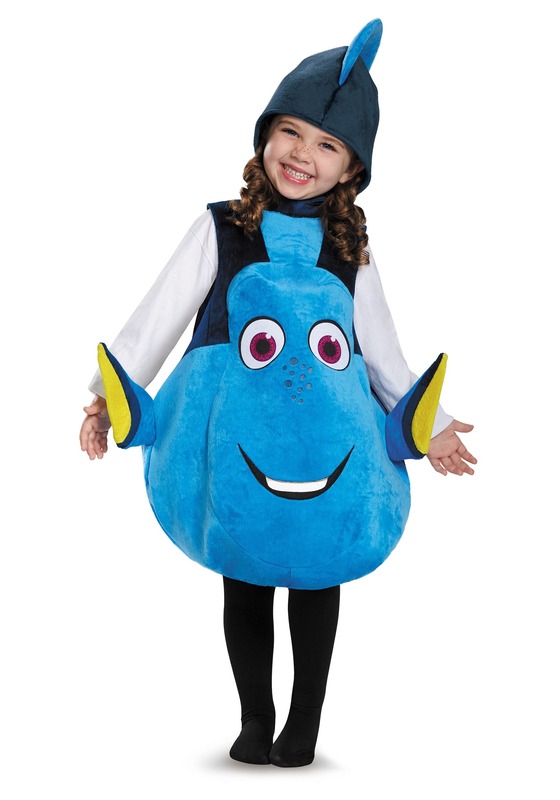 Of course, your little one is no stranger to the heart melting game, which makes this officially licensed Deluxe Dory Costume the perfect outfit for your little fishy. Based on Disney Pixar's latest adventure in the ocean, this child Dory costume comes straight from the silver screen to your child! The soft velour fabric tunic is designed to look just like the title character from Finding Dory and has a detachable tail that fits in the back. It even comes with a dorsal fin-shaped hood which makes your child's transformation complete. Of course, you'll want to teach your little one all about hide and seek and how to find their way home when you set her up in this costume! Just for fair warning, you may experience a warm sensation inside while watching your child reenact scenes from the movie. That's just the beginning stages of heart melting syndrome!